Sony's A7 features a full-frame sensor, pretty nifty. Sony has introduced the world's first (non-rangefinder) compact system cameras to feature a full-frame sensor - the Sony A7 and Sony A7R. Although Leica managed to squeeze a full-frame sensor into the Leica M9 and Leica M some four years ago, Sony is the first to squeeze this technnology it into a full-frame CSC. Two versions of the Alpha-branded cameras will be available, with the A7 sporting an anti-aliasing filter and the A7R featuring a higher pixel count. 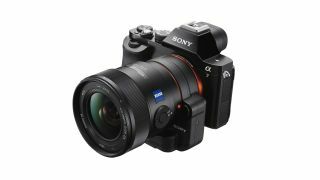 The A7's full-frame (35mm) sensor has 24.3 million pixels and is joined by a new Bionz X image processor, which facilitates high ISO shooting and full HD video recording. Clear Image Zoom has also been enhanced to help deliver close-ups without losing pixel count. Aimed at the video conscious user, the A7 and A7R feature advanced movie features, such as audio recording and clean HDMI output. An enhanced Fast Hybrid autofocus system is included which promises to combine the speed of phase detection with the accuracy of contrast detection. A new Spatial Object Detection algorithm claims to provide the fastest autofocus performance of any full-frame camera. Eye-detection AF promises to be accurate to a single pupil, while 117 densely placed phase-detection AF points are joined by 25 cross detection points. On the back of the camera is a tillable 921,000 dot 3.0 inch LCD screen, along with a 0.5 inch, 2 million dot XGA OLED "Tru-Finder" viewfinder, which offers a 100% field of view. Both of the cameras are also equipped with Wi-Fi and NFC technology, along with the capability for Sony PlayMemories apps. A new app has also been announced today, the Multiple Exposure app which automatically composites exposures. Other apps are pre-installed on the camera, including "Smart Remote Control", which allows for control from a smartphone or tablet. Five new full-frame compatible lenses have also been announced today. The E-mount full-frame lenses include two mid-range zooms (24-70mm and 28-70mm) by Sony and Carl Zeiss, two bright Sonnar T* prime lenses (35mm and 55mm) and a premium quality G telephoto (70-200mm) zoom lens. An adapter is available for using full-frame A mount optics, including the new 70-200mm A mount lens. The A7R is the more expensive of the two new bodies, but features a higher resolution sensor at 36.4 million pixels. It also has no optical low pass filter, which promises to help produce high levels of detail. At just 407g, the A7R claims to be the world's smallest and lightest interchangeable lens full-frame camera. The standard A7 weighs slightly more, at 416g, though both bodies are sized the same. The A7R is also dust and moisture resistant. The Sony Alpha A7 price will be priced at $1,999 body only, or $2,199 with a 28-70mm lens. The Sony Alpha A7R will cost $2,499 body only.